(AgriNews) –With about 83 percent of the nation’s winter wheat headed by June 3, the U.S. Department of Agriculture has forecast production of 1.2 billion bushels, 1 percent above the previous forecast and 6 percent lower than last year. The U.S. average winter wheat yield is projected at 48.8 bushels per acre, 0.3 bushels above the May estimate, but down 1.8 bushels from 2017. Illinois’ projected winter wheat yield was increased by 2 bushels from last month to 75 bushels per acre. If realized, the 510,000 harvested acres would produce 38.25 million bushels. The USDA reduced Indiana’s average yield estimate from 81 bushels per acre last month to 78 this month. With about 240,000 harvested acres projected, Indiana would produce 18.72 million bushels of winter wheat. As of June 3, 37 percent of the winter wheat crop in the 18 major producing states was rated in good to excellent condition, 12 percentage points lower than at the same time last year. Thirty-five percent of the winter wheat crop in the 18 major producing states was rated in very poor to poor condition, 20 percentage points higher than at the same time last year. As of June 3, 5 percent of the 2018 winter wheat acres had been harvested in the 18 major producing states. Harvest was underway in Arkansas, California, North Carolina, Oklahoma, and Texas. Record high yields are expected in Kentucky, at 80 bushels per acre, Michigan, at 90, and Tennessee, at 75. As expected, the USDA stuck with its initial corn and soybean yield estimates, keeping the U.S. corn average at 174 bushels per acre and soybeans at 48.5 to plug into the supply and demand estimates. Those projections are based on weather-adjusted trend models and assume normal weather. 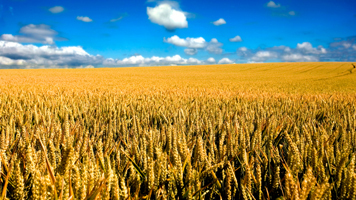 The report did provide a look at the nation’s crop progress. By June 3, producers had planted 97 percent of the nation’s corn acreage, two percentage points ahead of both the previous year and the five-year average. Eighty-six percent of the U.S. corn acreage had emerged by June 3, two percentage points ahead of the previous year and three percentage points ahead of the five-year average. Seventy-eight percent of the nation’s corn acreage was rated in good to excellent condition on June 3, 10 percentage points above the same time last year. Producers had planted 87 percent of the U.S. soybean acreage by June 3, six percentage points ahead of the previous year and 12 percentage points ahead of the five-year average. Sixty-eight percent of the nation’s soybean acreage had emerged by June 3, 13 percentage points ahead of the previous year and 16 percentage points ahead of the five-year average. As of June 3, 75 percent of the soybean acreage was rated in good to excellent condition.